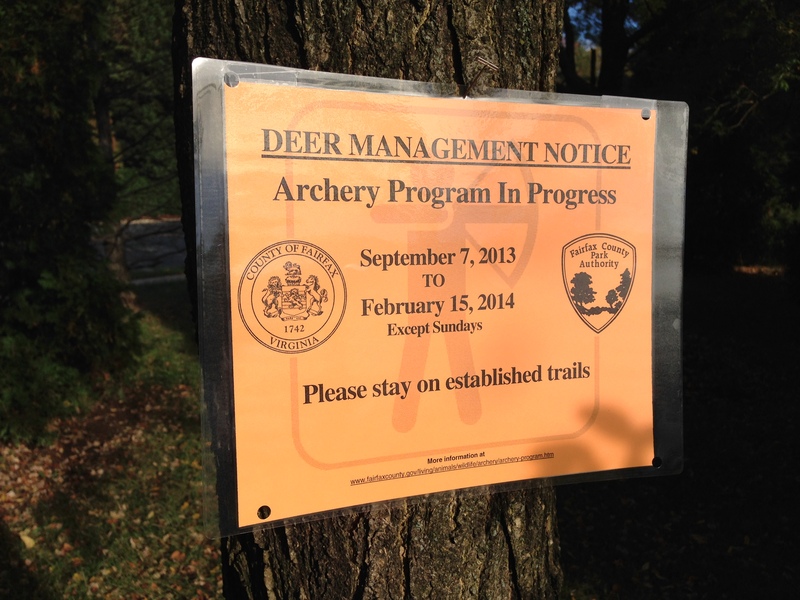 If you visit a park in fall or winter, you may notice orange archery signs popping up along trails and in parking lots. September signals the start of the white-tailed deer management season, and with that program come many questions from park users about the need for deer management and about the safety aspects of a deer management program. The Fairfax County deer management program originated in the late 1990s after a local librarian was killed in a deer-vehicle collision in Great Falls. 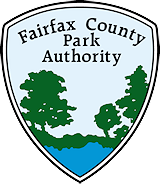 The program is overseen by the Fairfax County wildlife biologist, who serves within the Fairfax County Police Department. Deer management takes place primarily on parkland with the coordination and consent of the Park Authority. What started as a public safety response to deer overpopulation has expanded for several reasons. There is greater evidence and awareness today that deer browse is one of the top threats facing the county’s forested natural areas. Biologists from the Virginia Department of Game and Inland Fisheries estimate that there could be more than 50,000 deer currently living in Fairfax County. This is more than 100 deer per square mile, and that is six to ten times higher than a healthy ecosystem can support. Deer have become over-abundant because we feed and shelter them. Our suburban ecosystems, including our fertilized lawns and gardens, create sumptuous buffets for deer. Many does give birth to twins each year. Large predators, such as resident bears or packs of wolves, are gone from this area. Humans are the only remaining predators of deer, and hunting pressure has steeply declined over the past few decades. In many of our parks, there is no native vegetation growing between six inches and six feet above the ground because of browsing deer. This summer, our natural resources team measured browse levels at 140 plots countywide and confirmed ongoing, severe browsing in most of the surveyed parks. Many local biologists and naturalists are concerned about the future of our forests, and citizens also have cause for concern. As mature trees die or fall during storms, what replaces them? Under current conditions, very few native seedlings will survive, and invasive species, which the deer aren’t able to eat, often take hold in their place. Over the long term, forests will degrade and will fail to provide the air quality, water quality and stormwater management benefits we rely on. On a personal level, the property values of homes next to parks may decrease, and the quality of life will diminish as there are fewer places to escape into the cool and quiet of a summer woods. The loss of native shrubs and trees also contributes to a broad decline in native insects, migratory songbirds, and so on up the food chain. It’s like a house of cards. Pull out the right card at the bottom, and the whole pyramid is coming down. The deer management program relies on several different methods of population reduction including archery, managed hunts, and sharpshooting. There are currently no feasible alternatives to controlling deer populations other than lethal means, in both effectiveness and expense. Archery is the least imposing and most cost-efficient method currently in use because parks can remain open and volunteers can be recruited to hunt on behalf of the county. We recognize that some residents oppose lethal deer control, so we continue to provide public education and to address specific concerns regarding safety. For example, new signs include the international symbol for archery for those who may not be able to read the text. 2013 is the fifth year that we are allowing archery in the parks. In 2012, archery was implemented in more than 30 parks, and there were no safety incidents with people or with pets. This includes heavily-visited parks such as Burke Lake Park, Lake Accotink Park, Huntley Meadows Park, Riverbend Park, Ellanor C. Lawrence Park, and Wakefield Park. The 2013 archery program has expanded to over 40 parks, including several inside the beltway. Each park has been marked with orange signs. Hunting is confined to tree stands in specific areas of the parks, with hunters at least 50 feet from a trail and at least 100 feet from a property line. Each site is reviewed for safety. All of the volunteer archers must abide by strict rules to participate in the program. They must have superior ability with the bow and must qualify at a range to participate. Modern archery equipment is extremely precise and effective, and the program’s wounding rate has been less than four percent each year. The next time you see a sign during one of your visits, take a minute to search for an oak, maple or hickory seedling. Do you see any? The future of our forests depends on fewer deer. Author Kristen Sinclair is the senior natural resource specialist in the Park Authority’s Natural Resource Management and Protection Branch. This entry was posted in Uncategorized and tagged Archery, Deer Browse, Deer Management, Fairfax County, Invasive Plants, Native Plant Species, Natural Resource Management, nature, outdoors, Sharpshooting, Trees, White-tailed Deer, Wildlife Conflicts on October 9, 2013 by Fairfax County Park Authority.